Paco Díaz (Palma de Mallorca, Spain) on 3 November 2008 in Cityscape & Urban. A very cool shot Paco, the heavy sky looks great, nice process. Very beautiful picturen, great sky!! Magnifique prise d'une ville que j'aime tout particulièrement. NY est le paradis des photographes, c'est une ville superbe. Heavy storm on the way. I can feel it. Hey, that's my town! What a great sky. Beautiful work. Cette vue a beau être super connue on ne s'en lasse pas... Et là les tons et le ciel sont magnifiques et en font une photo hors du commun. Sublime and beautiful detail, great tone Paco and a wonderful image. Wow, wonderful shot of a classec view of NYC! Love the heavy sky and the light! Beautiful! wow! nice shot! great composition! A fine strong image. the sky is lovely. Gorgeous! Well done. Love the tones. You chose a really perfect time for this. Interesting shade...a bit different that what is popular. partes que componen la toma. You could wait here for a year and not get more dramatic light than this. Fabulous capture! @Stephen Phillips: Thanks, Stephen, I was in a taxi boat crossing to Brooklyn. It was a wonderful sight. 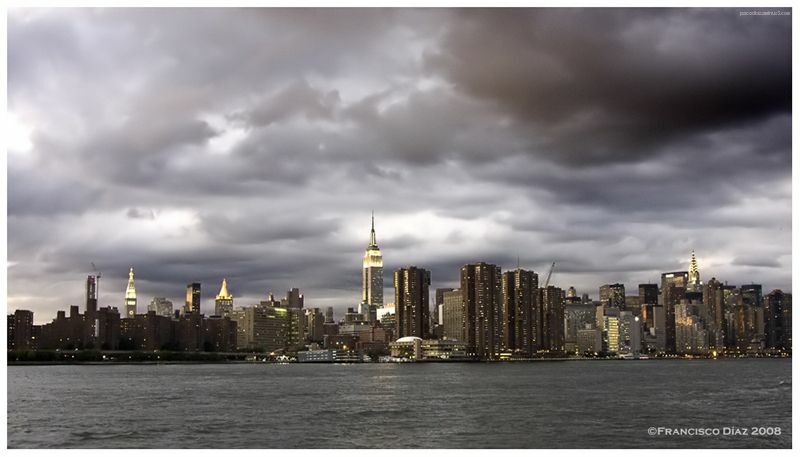 Never tire is seeing images of that skyline but this has the extra drama of that threatening sky . . nice one, Paco. Nice sky! I first thought it was a long exposure shot, but then realized you had increased the ISO. Very nice shot! I like the drama here, great tones of this iconic skyline. great light hitting the tops of the tallest buildings! awesome sky! Muy bonito panorama Paco , las luces de la ciudad y ese cielo de tormenta le dan una atmósfera especial. this is a superb cityscape! great light and the dramatic clouds over the building create a wonderful mood!